Do you like Italian food? I do. It’s what I want for comfort food, family dining, or even for reliable fine dining – although it’s not what comes to mind for innovative flavors and original presentations. Don’t get me wrong. Italian is a beloved and entrenched part of American eating. It’s just not where I look for something new and thrilling. At Spiga in New Canaan, I was thrilled. The encyclopedic menu brings an almost overwhelming swath of Italian food together on one page. Choosing from this bounty is a challenge – it’s easy to overdo. I recommend going with a group so you can sample something from each of the eleven categories on offer. 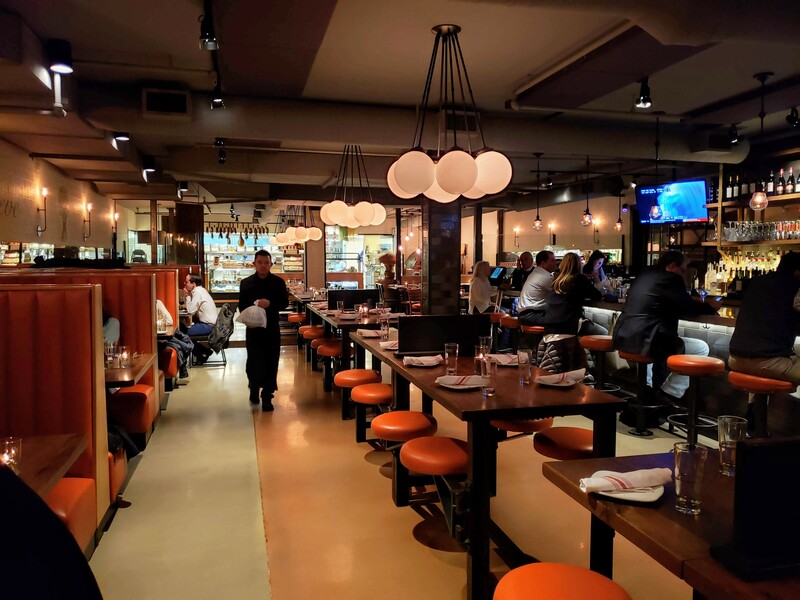 The comprehensive menu includes sections for: Mozzarella Bar, Salumi, Crudo, Pizza (more about that later), Small Plates, Salads, Pasta (house made), along with Poultry (free range), Meat (all natural), and Seafood (sustainable). And they’re made with impeccable ingredients. 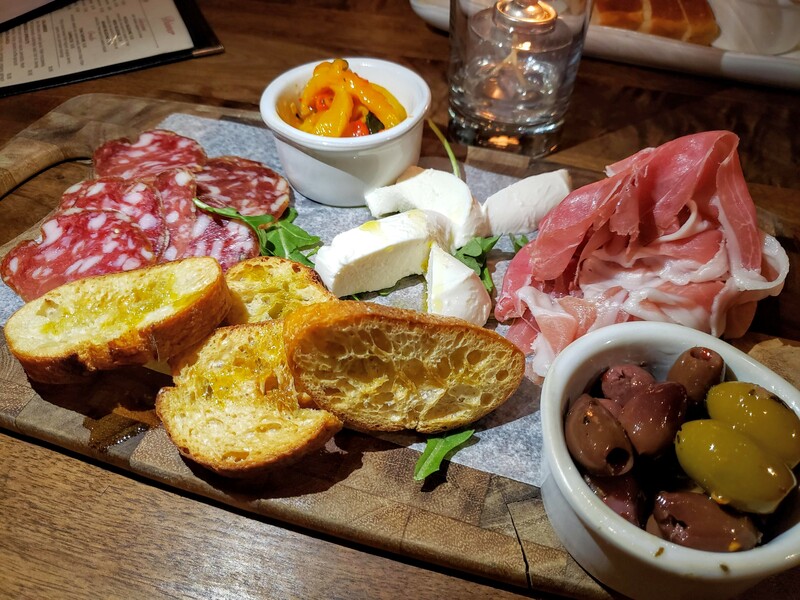 At Spiga they bake their own bread and make their own pasta, bring in the best salumi from both Italy and America, source organic produce, and carefully choose their meats – all under the direct supervision of owner Gino Racanelli. In each category the dishes clamor to be ordered like puppies begging to be cuddled. 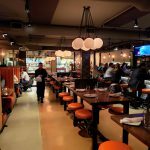 Gino is a restaurant lifer with a string of successful eateries to his name in both Westchester and Fairfield going back to 1971. 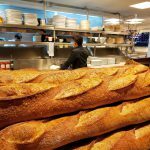 He works closely with each station – pasta maker, pizziola, and line cooks – to have the food done just right. His approach at Spiga is very hands-on old-school. 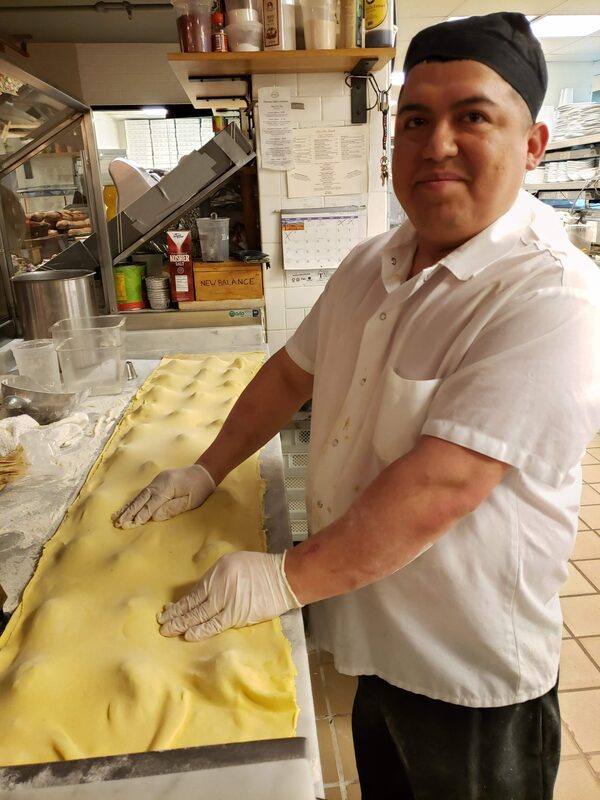 Gino took me over to the pasta station, still working at the dinner hour, to see some beef short rib ravioli in progress. The already filled strip of fresh pasta, like the peaks of the Appalachians arranged from south-west to north-east across the workbench, were ready to be cut into generous rounds. 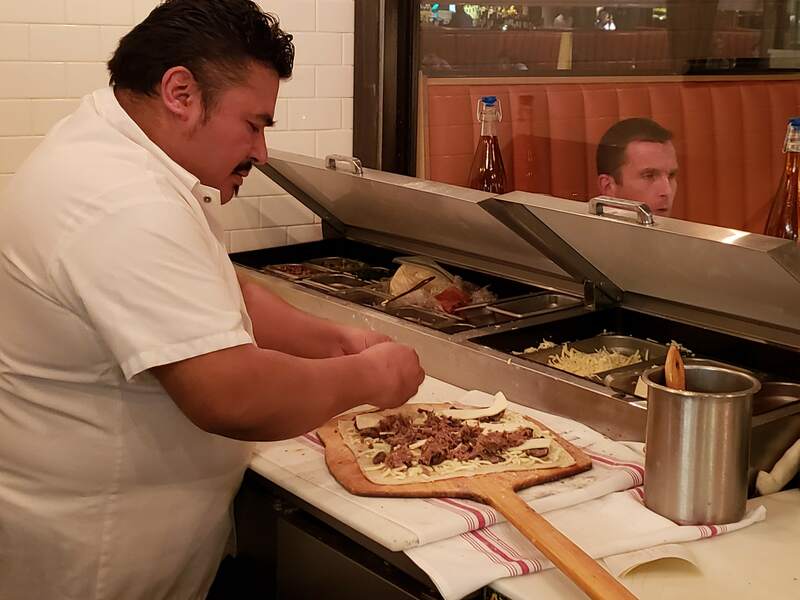 At the pizza station, 12-inch square, thin crust pies are made to order and shoveled into the Italian brick oven, emerging a few minutes later with a charred bottom, bubbling top, and wonderful aroma. 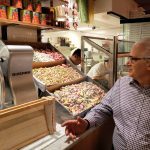 Gino pointed with pride to the showcase of cured meats – the best of each type he can find. 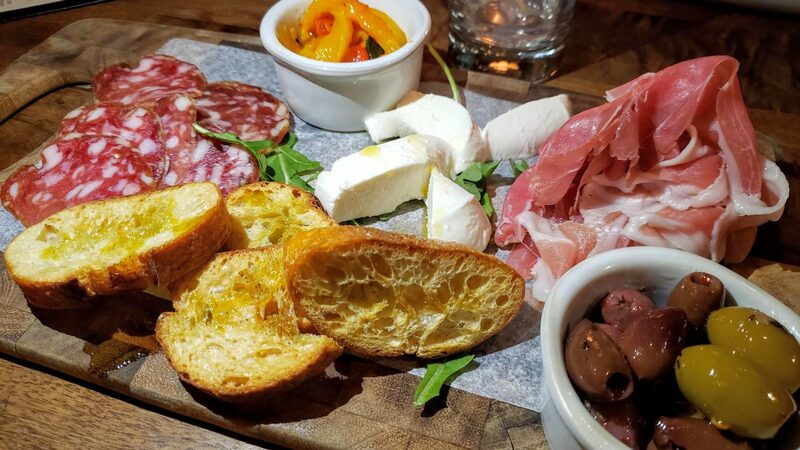 The broad selection of salumi sets Spiga apart from run-of-the-mill Italian restaurants. Back at the table the eating kicked off with a selection of cheese and salumi ($20): prosciutto di Parma, salami gentile, fresh mozzarella, roasted peppers, cured olives, and olive oil brushed bread rounds. 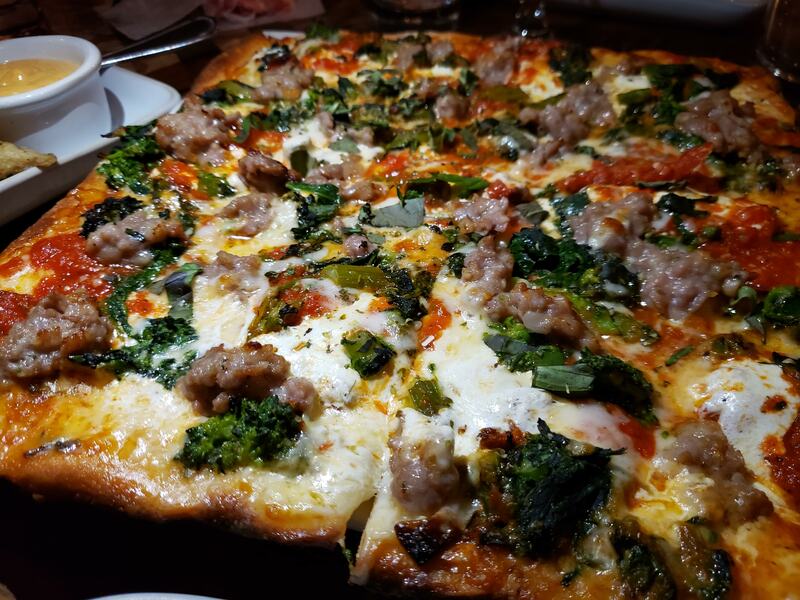 Next up, a square 12-inch pizza rustica (20) well-browned and bubbling with fresh mozzarella, broccoli rabe, roasted tomatoes, spicy sausage, and San Marzano tomato sauce. Marsha wanted the crispy artichokes (14). Usually not my favorite, these wedges of baby artichokes were sweet and tasty, deep fried in their crisp batter. The accompanying lemon aioli added a welcome tang. 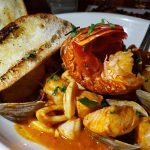 Shellfish overflowed from the dish of market cioppino (30). 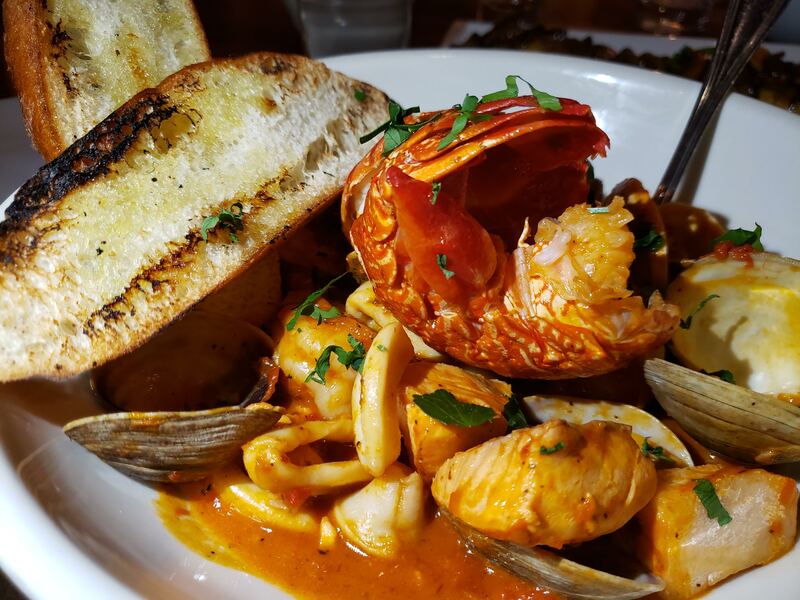 Lobster, shrimp, calamari, salmon, clams, all simmered in a fragrant tomato broth. Shrimp are properly cooked when they curl into a comma, but not into a tight wreath. These were perfectly done, as were the rest of the cioppino fishes. A glass of Beneventano Falanghina from Donnachiara (13) – a white wine with aromas of pears and peaches, a full body, and tangy acidity, a little like an Italian Viognier – was a good match with these courses. 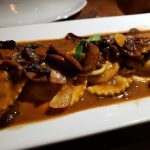 After seeing them being made, I had to taste the short rib ravioli (24). 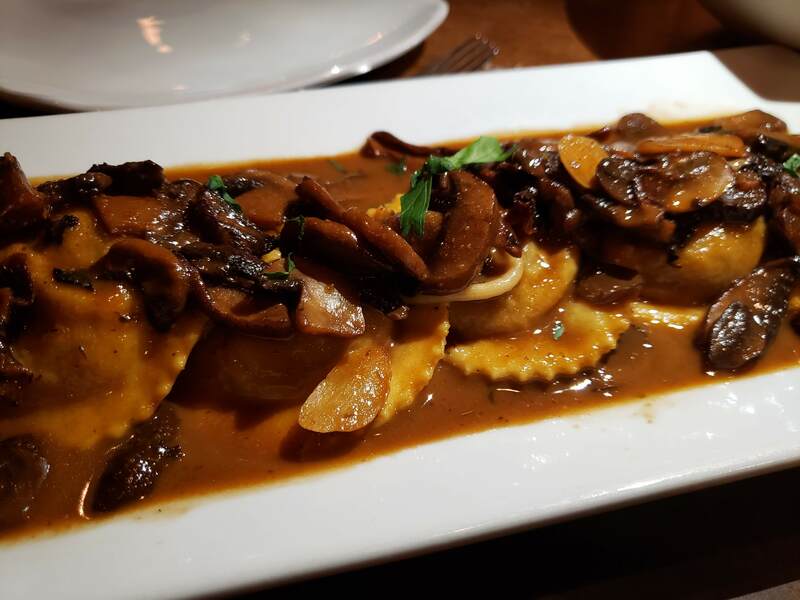 Five of the plump, generous pillows were shingled on a plate under a blanket of mushroom marsala sauce. The short rib filling was beefy and well seasoned. A glass of Chianti (16) was a good foil for the rich ravioli. I’m not going to tell you how many dishes there were on the menu (there were a lot), but it was the kind of menu that entices you back. I have a waiting list in my head queing up for the next visit. 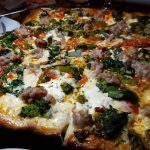 Spiga has joined Oak and Almond on Main Avenue and Bar Sugo on Wall Street on my list of Italian restaurants for memorable meals. All three, in their own way, give an exceptional experience in a cuisine that is often taken for granted.